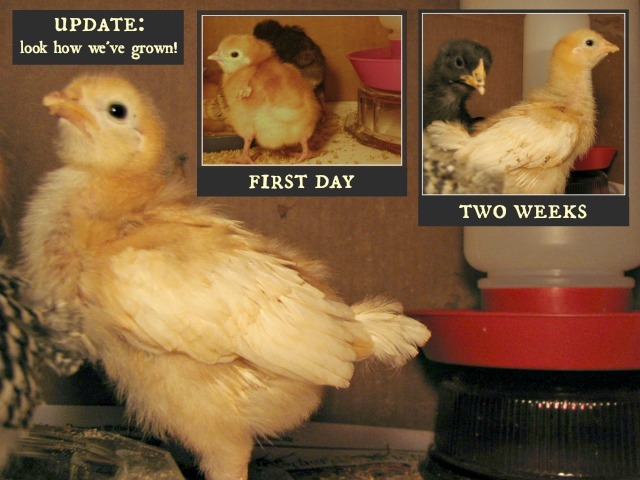 In order to fulfill a fellow-blogger’s request, I am subjecting you all to a post about my chickens. 🙂 I grew up around chickens and many other animals, and was so happy when my husband and I moved to a home where we could have chickens of our own. The antics of our hens and roos have brought a smile to my face many times over the last four years. 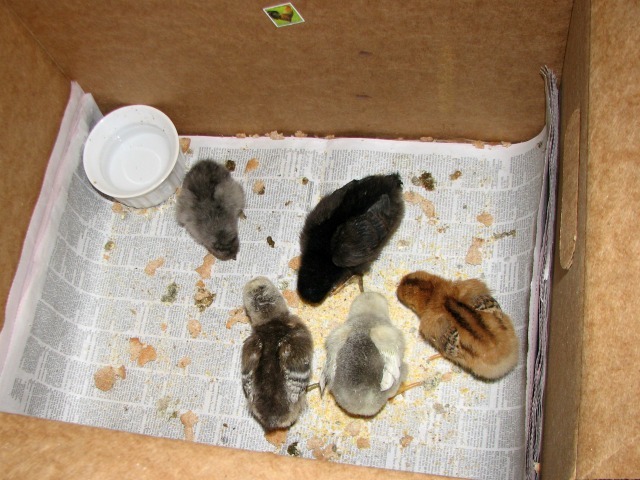 Our original group of chicks: a Blue Cochin, a Cuckoo Maran, an Austrolorp, a Columbian Wyandotte, and a Rhode Island Red. 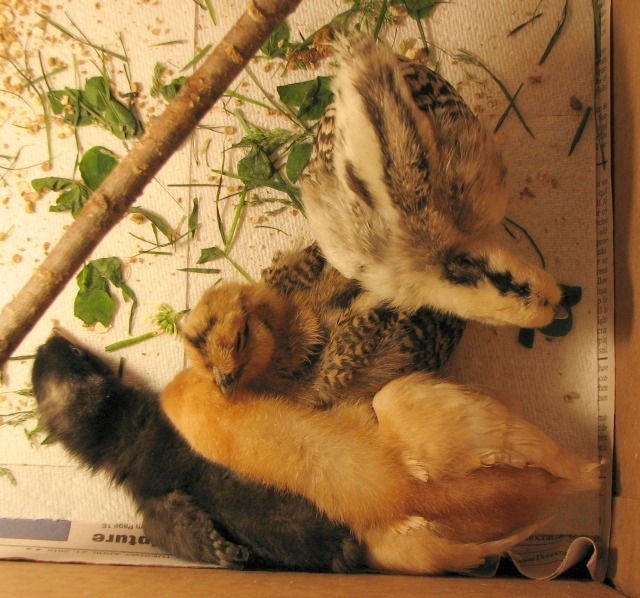 NOTE: This photo was taken when we first brought them home and does not show a proper setup for raising chicks. What perks? If you take the time to watch them, each chicken has its own hilarious personality that provides relaxing backyard entertainment. And, of course, there’s the eggs! You’ll never want store-bought eggs again after tasting homegrown ones laid by healthy, pasture-ranged hens. None of my other pets ever gave me free breakfast every day! 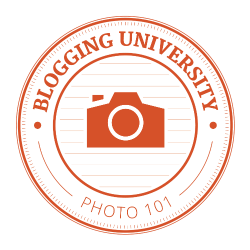 The information in this and upcoming posts will not be a complete guide on chicken care. There are multiplied resources at your fingertips on the internet that provide specific, detailed information about raising chickens and dealing with sicknesses, injuries, and such. One good place for asking questions and finding helpful information is on the Back Yard Chickens website. I’ve gotten advice from many kind, helpful people on their forum. I have owned many pets over the years. My husband is always accusing me of “trying to turn this place into a farm.” Our list of previous and current creature residents includes: bugs, butterflies, cats, chickens, dogs, fish, gerbils, guinea pigs, mice, slugs (Yes, you read that correctly: slugs. That’s one we will not repeat, no matter how many young, sweet children bat their long eyelashes and beg and plead for them! ), and a turtle. Of all these animals, hens come in third on my personal list of easy-to-care-for pets (add a rooster or two and things get slightly more complicated). First is my Three-Toed Box Turtle that I’ve had for nearly 17 years. Provide some shelter and shade, keep a fresh dish of water in the pen, throw a little food in there once per day, and you’re good to go. When I keep her in an outdoor enclosure, she hibernates underground for six months of the year. Pet care doesn’t get much easier than that! Second is an outdoor cat. They are definitely low-maintenance pets. Provide shelter, keep dishes of fresh food and water available, don’t get too attached to the beautiful birds in the yard, and you have a happy lap-warmer. We bought our chicks from a farmer at a weekly outdoor flea market. If you have the opportunity to hand-select your chicks, look for fairly active chicks (eating, drinking, happily peeping) with clear, bright eyes, clean bottoms, and straight toes. Pick up each chick and examine it carefully. Don’t buy a chick that is extremely lethargic, cloudy-eyed, dirty around it’s bottom, wounded, or extremely loud (incessant loud chirping indicates a problem). 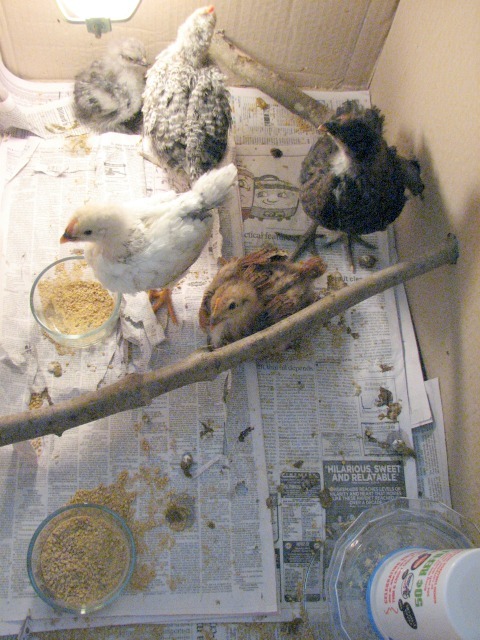 A simple brooder for housing your chicks is a large cardboard box or plastic tub lined with newspaper. It’s best to place a layer of paper towel on top for the first couple of weeks to give the chicks more traction for walking; newspaper alone is a little too slick and can lead to splayed leg problems. If you put multiple layers of newspaper, you can simply remove the chicks, gather up the top couple of layers by the corners, and toss the mess in the trash without having to do a major clean-up every day. Believe me, there is a lot of clean-up involved with chicks from scattering food, splashing water, and walking around on their little piles of free fertilizer. A half-and-half mixture of white vinegar and water makes a wonderful solution for cleaning their food and water dishes (and their house, if you have them in something other than a cardboard box). The acid in the vinegar kills germs and counteracts the ammonia smell from their prolific poo. They also create tremendous amounts of dust from scratching in their feed and preening off the waxy coating that covers each new feather they grow. So, you may not want to place them in your living room near your television and electronic equipment as I did at first. Five tiny chicks make a big mess! A very important part of their housing is a heat source. Chicks can easily get sick and die when they become chilled (remember, they usually spend most of their first week cuddling under a mother hen who’s body temperature runs over 100 degrees Fahrenheit). You can buy an actual heat lamp with a special bulb, or use a 100-watt incandescent light bulb in a socket with a reflector around it. 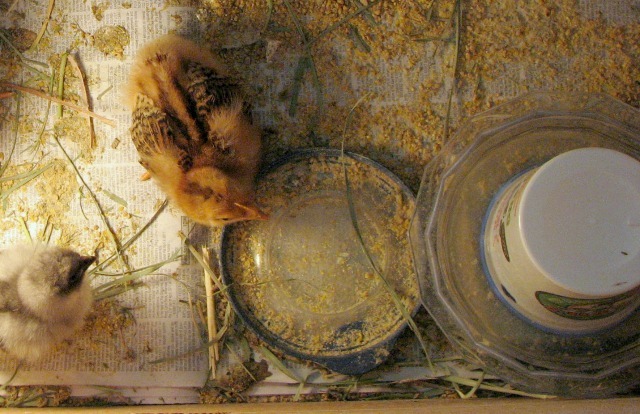 Place the lamp to one side of the box, so the chicks can move to the cooler side of the box when they feel too warm. The warmest area in the box should be about 90-95 degrees the first week and be reduced by about five degrees each week. If your chicks stay huddled together as close to the light bulb as possible, their house is too cold. If the chicks are lined against the wall or panting on the far side of the box, the house is too hot. Simply raise and lower the light in the box to achieve the desired temperature. In addition to warm, safe housing and love and attention, you will, of course, need food and clean water. Have these available at all times, and the chicks will regulate the amount they need. The feed can be placed in a shallow dish or lid. Actually, you could probably just pour it in a pile in their box, if you wish, because that is where they will have it all scattered within a short time. There are many commercial brands of feed to choose from. Some are medicated and some aren’t — there are pros and cons to each type. You can supplement their feed with dry oatmeal, ground flax seed, and assorted greens and weeds from a pesticide-free yard. Place the water container in the cool end of the box, away from the heat lamp. I recommend buying a commercial waterer or making one. If you leave an open container of water in their house, they will usually find a way to spill it, which isn’t great if their home is made of cardboard! They can also fall in and get chilled or drown. Find a plastic cup with a well-sealing lid and a shallow, heavy dish that is a little larger than the top of the cup (a flat-bottomed glass candy dish works great). The plastic lids from cake frosting containers fit perfectly onto many cups I’ve owned over the years. You could also use a 32 oz plastic yogurt container or a plastic soda pop bottle. Examples of items you can use to make a chick waterer. A commercial waterer next to my homemade version. Mine is made from a restaurant cup, a frosting lid, and a candy dish I bought at a flea market (total cost: 50 cents). Both waterers work very well. Cut one or two small holes (1/4 inch or so) near the top of the plastic cup, fill it with water, put the lid on it, and turn it upside down into the dish (cover the hole with your finger as you do this to keep from pouring water everywhere). Water will fill the dish until it reaches the level of the hole you made. Whenever the chicks drink (or spill) enough to lower the water level below the cup’s hole, it will automatically refill itself to the previous level. Too keep the water cleaner and the chicks drier, keep the lip of the waterer at the height of the chicks backs when they are standing — the same goes for adult chickens and their water buckets. You can set the waterer on top of things (small containers, bricks, etc.) to raise it higher as the chicks grow. I’ve raised the height of the waterer once and already need to do it again. See the dish under the yellow chick’s belly in the main photo? That’s what the waterer is sitting on in the first day photo. Within a week those little balls of fluff will be sprouting wing and tail feathers and worming their way into your heart. 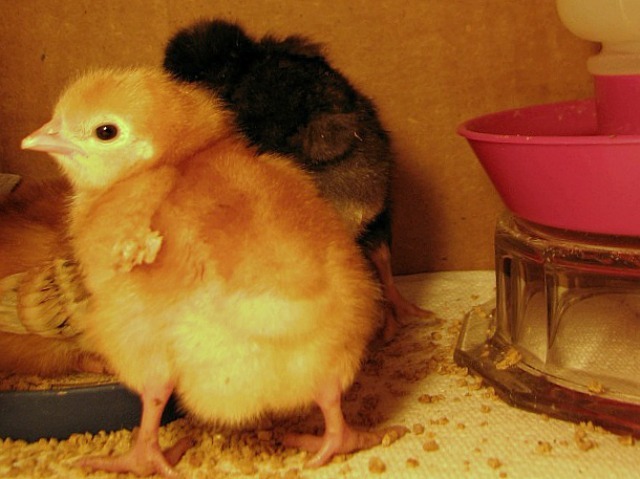 Be prepared to get larger and taller boxes as the chicks rapidly develop. A wire top on their box will keep them from flying out as they begin testing their wings. As they grow, it’s nice to run small tree branches through the sides of the cardboard box to make tiny roosts for them; they will love it. It can be quite funny to watch them clumsily learning how to use the roosts. Three-week-old chicks enjoying a larger home, complete with roosts. One last thing I’ll mention about pretty little chicks is how many times their appearance will change. The colors on chicks are often completely different than their coloring as adults. The first set of feathers they get can also be very different from the patterns and colors of their feathers as adults. Colors and patterns may even vary slightly from year to year on adult chickens because they grow new feathers each fall after an annual molt. Showing off the patterns on three-week-old “Pecky’s” wing feathers. She is a Rhode Island Red and, four years later, is still my favorite chicken. She loves to cuddle beside me when I’m relaxing and to “help” me whenever I pull weeds or dig in the yard. 4/25/15 — Our two favorite hens passed away this last week. One was injured and had to be put down, and I think the other died of old age. So, today I went to the Saturday flea market and bought three chicks. The chicks are tuckered out from their big transition to a new home. One hour in and this little Barred Rock chick is already my daughter’s favorite. The sleepy chick, who is now officially named “Peepers” because it is so loud, took a nap on my daughter’s shoulder. 5/25/15 — She’s growing fast! One month old, and “Peepers” still gets a shoulder ride now and then. 5/2/15 — We bought two more chicks from the same person I met last week, which was convenient so that we could place them together without worrying about any of them passing diseases to each other. We did not end up with the peaceful little flock we imagined, however. Within moments of placing the new chicks into the box, a battle ensued. This gave me an idea on another topic to cover in this chick-raising blog post: how to tell if your chick is a boy or a girl! Our new chicks are the two patterned ones at the top of this photo. The light-colored chick at the top of the photo probably won’t be at our house for long; I’ll explain why a little farther down this post. We picked out two bantam Cochin mixes. The man we bought them from had hundreds of chicks in so many breeds and varieties! He has been crossing Cochins, Silkies, Naked Necks, and Frizzles to design some interesting and unusual chickens. For those of you who are unfamiliar with chicken breeds, chickens are categorized into “standard“ (usually weighing 4 – 8+ pounds) and “bantam“ (usually weighing between 1 – 3 pounds). Cochins come in both sizes and are very fluffy with feathered feet. Silkies usually only come in bantam size and are known for their hair-like down, rather than regular feathers; they also have bluish-black skin and extra toes. Naked Necks come in both sizes and have no feathers on their necks (which is creepy-looking in my opinion! lol). Frizzles come in both sizes and many varieties; the one defining trait is that all frizzles “look like they stuck their finger in a light socket,” as the old saying goes. Male or female? Cockerel or pullet? 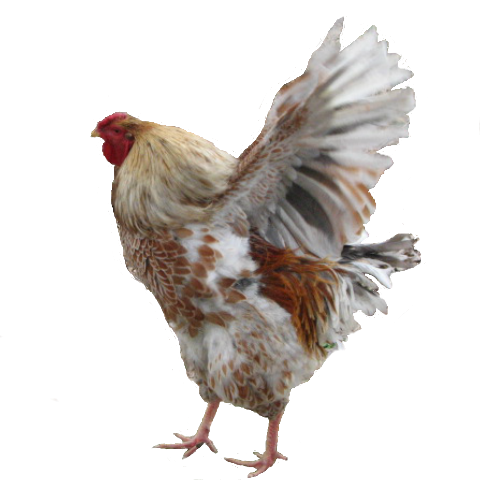 (“Cockerel” and “pullet” are simply chicken jargon for roosters and hens that are less than one year old.) Other than twiddling your thumbs for about six months until your chicken either crows or pops out an egg, how can you figure out which one you have? If you’re looking at a fuzzy little day-old chick, I’d say just flip a coin and hope for the best if you are desiring a certain gender. Even professional “chicken sexers” can’t give you a 100% guarantee that they have correctly labelled their chicks. However, when we added our two new chicks (who were at least two or three weeks old) to the three chicks we bought a week ago, we could say with confidence that we had at least two roosters. Within moments, the largest Rhode Island Red (whom I had already been suspecting could be a rooster) and the smallest Cochin (the one at the top of the previous photo) stood toe-to-toe and began the familiar “rooster dance” (that’s what I’ve termed it, anyway). Dodging and weaving their heads, they circled each other with eyes locked and hackles raised before starting to peck and chase each other. The Rhode Island Red soon had the upper hand, due to sheer size advantage, and periodically used his beak to grab the back of the other’s head feathers and give them a good pull and shake. Unfortunately, the tiny newcomer is quite spunky and would not submit well enough to satisfy the larger chick**, so we ended up dividing the brooder box into two sections to separate them for now. The box has been peaceful and quiet for several hours since we broke up the boys. If you have two (or more) chicks who frequently dance around and attack each other, they are very likely to both be roosters. As chicks, the boys seem to be much more preoccupied with the idea of dominance than the girls do. A chick that has larger feet than all the others is possibly a male. A chick whose comb and wattles grow bigger and/or turn red much faster than the others is likely to be a male. 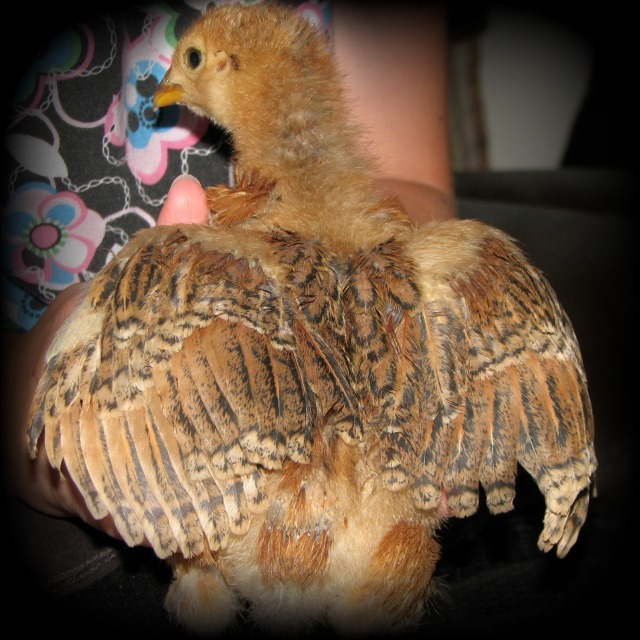 As he gets older, a cockerel will develop what is called “saddle feathers” on his back near his tail; these are longer, more pointed, and droop downward compared to feathers on a hen’s back. In most breeds, a cockerel will also eventually grow long, curved “sickle feathers” that hang over the end of his tail. Last time we got chicks I only bought two and was hoping for females. They were Blue-Laced Red Wyandottes, a beautiful breed that I had wanted for a while. I thought, “We probably won’t be lucky enough to get two girls, but surely at least one of them will be.” Can you guess how many were roosters? Yeah, both of them were. Here is our biggest of the two boys: “Lacey” the rooster. (You can tell by the name we were expecting him to become a hen. The same thing happened with our first rooster, “Buttercup.” Poor guys.) He was HUGE! We still have several of his large, long-legged daughters. Thanks for reading, and best wishes to you and your poultry pals! Very nice post, very informative. I am sure those who have never raised chickens will find your information and tips very helpful. Believe me, those home grown eggs are many times better than those you buy at the store. Look forward to your next chicken post. Thanks. I may be taking my own chick-raising advice soon, as we just had two of our original chickens die this past week: the earring-eating Cochin (my daughter’s favorite hen) and the Rhode Island Red (my favorite hen). Our original trio of hens is now down to one, so we may get a few new chicks to fill out our flock.